This entry was posted on Saturday, May 19th, 2012 at 12:37 am and is filed under FPB 64 Updates. Both comments and pings are currently closed. I give up, what happend to the engine air intake? It is integrated into the port side seat base. That’s a Circa design build from an earlier era. 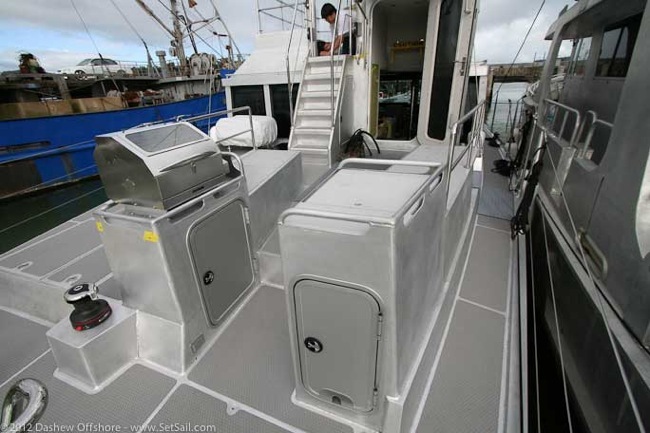 From these shots the aft deck configuration appears to be somewhat different previous 64’s, additional storage lockers maybe? Evolving design or customer specific changes? Or I’m just seeing things? 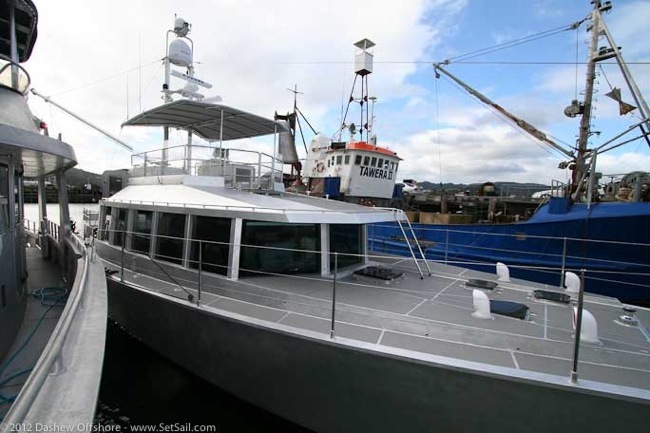 The new aft deck configuration is standard with boats five through nine. What are the advantages of the new aft deck configuration? The main advantage is a cozy place to sit, lounge, read, and eat in the lee of the flying bridge. The trade-off is loss of an easily stored second dinghy. There is also a large locker under the stairs to the flying bridge for jackets, foulies, and shoes, freeing up the locker inside for use in the galley. Hi Steve….nice improvements, particularly the under stairs locker for wet gear etc. The new aft deck seating configuration appears to be permanently welded in place. I thought that it was going to be bolted in place to allow removal for that second dinghy stowage, if the need arose? Or is that an optional approach? Also, has anyone opted for the smaller galley/larger saloon area layout? Good catch! 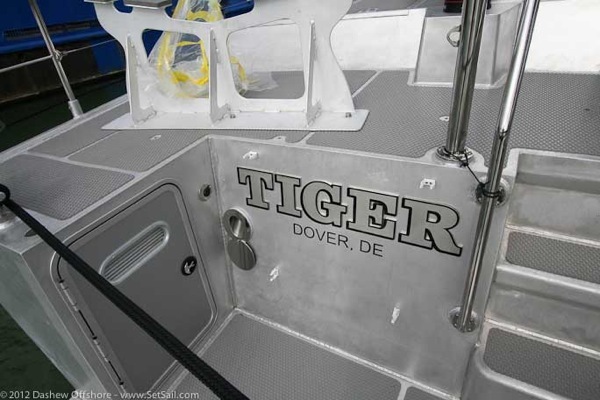 The aft deck seating arrangement you see aboard FPB 64-5, Tiger, has bolt-down seating sections, but the boxes aft are welded to the deck. 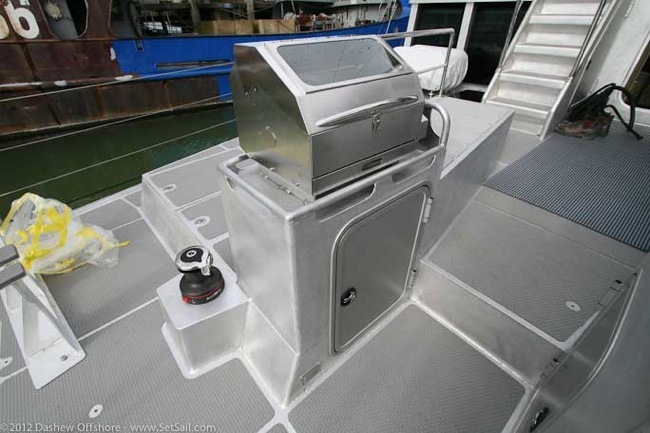 These welded boxes accommodate the BBQ, and in Tiger’s case – a live bait well that has the shore power connections located in a separate section. 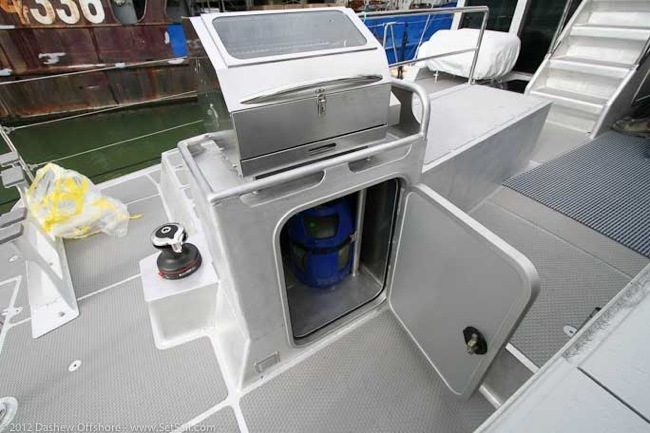 For those wanting the option of carrying two dinghy’s aft, the more conventional aft deck, more similar to hulls 1-4, is still available. 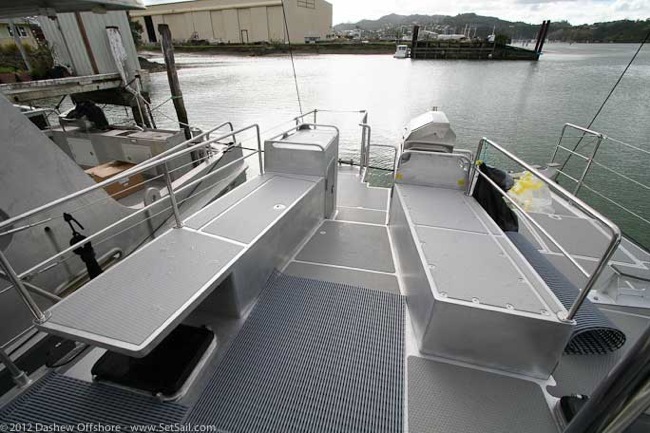 The new aft deck seating arrangement could carry a lightweight rowing or sailing dinghy in a custom rack above the starboard seat if a second dink is desired. The seating sections can unbolt from the deck, but are not likely to be removed unless access to the engine room through the soft-patch were required. Owners of hulls 6, 8, and 9, have selected the smaller galley/larger settee layout. It will be fun to experience this later in the year when #6 is delivered to her Australian clients. One of my irritations with my present boat is the frequency and time involved with wiping down / polishing the stainless steel and one of the FPB 64 owners mentioned this also. Have you looked into the possibility of using Monel or one of the other copper/nickel alloys (70% copper 30% nickle?) for the handrails? While pricy it may make sense as a small percentage of the total cost on an owner operated boat of this size. I was actually thinking of all the rail around the Matrix deck on the big boat. The amount of rail on that seemed rather daunting. If one can hose it off and walk away I’m all over that. Speaking of hosing it off. 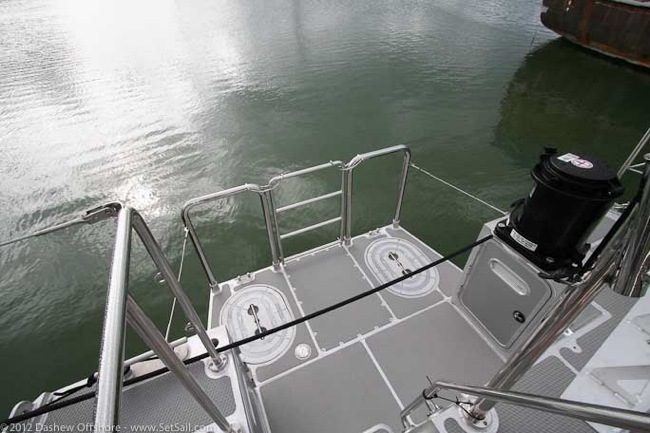 Do you have a built in pressure washer system on your boats? If the pressure pump was in the engine room so all you had to carry around on the deck was 15ft or so to plug into several quick connects that would be very convenient. The rails around the Matrix deck are anodized aluminum. We had a pressure washing system year ago on Wind Horse. 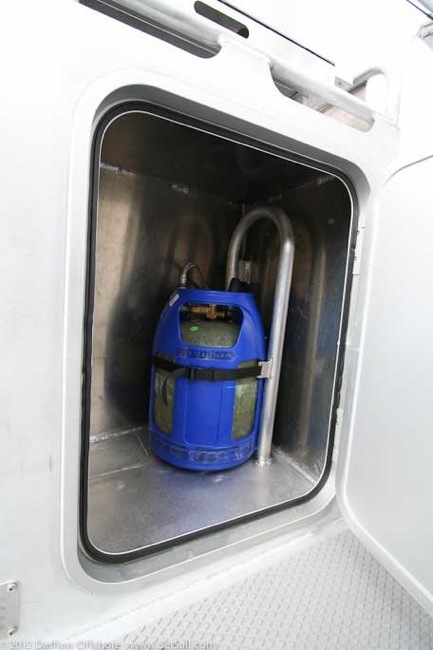 Today it is much simpler to buy a compact electric unit and move it around with you. I noticed the open stairs going from the pilot house to below. 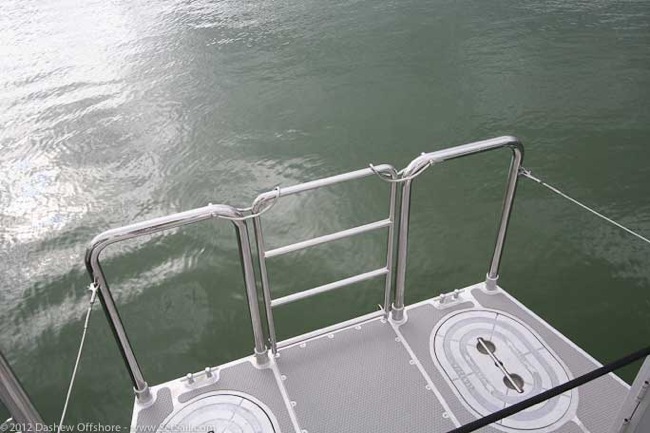 In the event of a role over and or port hole breakage the water that enters the pilot house could go below. Wouldn’t it be safer to be able to seal off the below area? Actually, Roland, those open stairs are on the outside of the great room. Once you are down the stairs and standing on the main deck you then enter the great room through the its water tight door. Steve, I understand the great room is the deck level room with glass all around and an open stair way leading to below. In the event of a glass breakage in the great room it appears water has the open stairway to descend to the below levels. Would it be a safe feature to seal off the below levels from the great room with a water proof door? That way if there is a glass breakage water cannot go below. It would only have access to the great room. The windows are massively strong, with stiffness well in excess of the Lloyd’s Special Service rule. Forward windows have built in storm shutter system. Side windows have storm shutter provisions should one be lost. That said, we are looking into the practicality of sealing off the Great Room right now. we’ll keep you advised (and thanks for taking time to send the idea). Steve, regarding your practical challenge with sealing off the great room I wonder if the option to put the door at the bottom of the stairs would have merit and in case you were exclusively thinking of putting it at the top of the stairs maybe this helps. A door at the bottom may not need much additional structure and would not obstruct the view to the outside from the great room. The only draw back is that in the unlikely event of water gaining access to the great room the stair well would be flooded. But all it would take is a hand pump nested somewhere permanently to solve that problem. I want my new day trading job to be massively successful so I can line up for this fantastic boat you have invented. In the mean time I will make due with my 30′ Cheoy Lee/Herreshoff. Was Roland referring to the Great Room / Pilot house? Is there a removable table for the aft deck seating area? I assume he was referring to the stairway between the Matrix deck and main deck, which is outside the man watertight door. 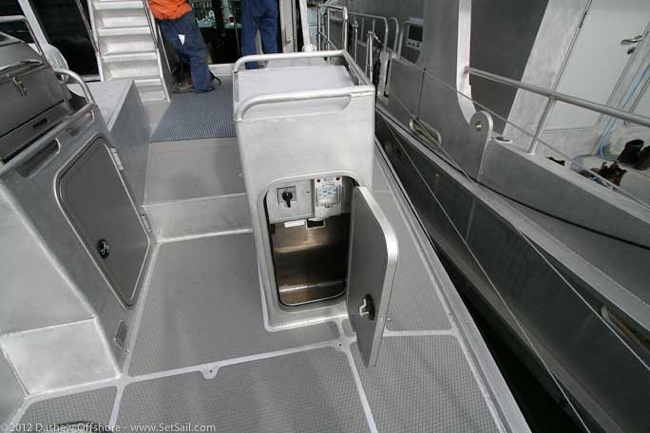 There is table under the Matrix deck extension, aft of the great room aft bulkhead (along with a day head, outside storage, and a counter with a sink.